The apartment is in Shed 23 on the desirable Western side of the Wharf and offers 63 square metres of space including the decks. The interior has been renovated and the open plan layout will allow you to enjoy the sweeping views that span from the Viaduct, across to the harbour bridge and beyond. Whether it be cooking in the kitchen, relaxing in the lounge, or enjoying the exterior deck, you'll appreciate the afternoon sun and sunsets that only Princes Wharf owners will experience. 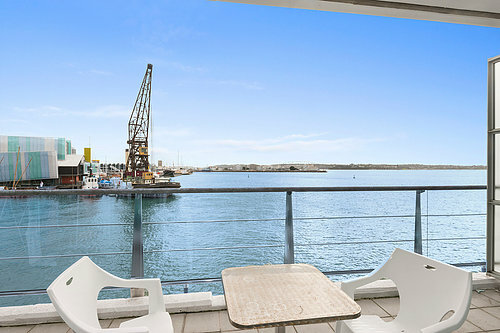 A home or holiday spot perched on top of the water, with some of the best views in Auckland, there are options galore if considering this as a rental property. To top off the arrangement, a secure car park and a storage locker are offered as part of the package. The apartment is currently rented on a fixed term until December 2017 and the tenants are paying $850 per week.